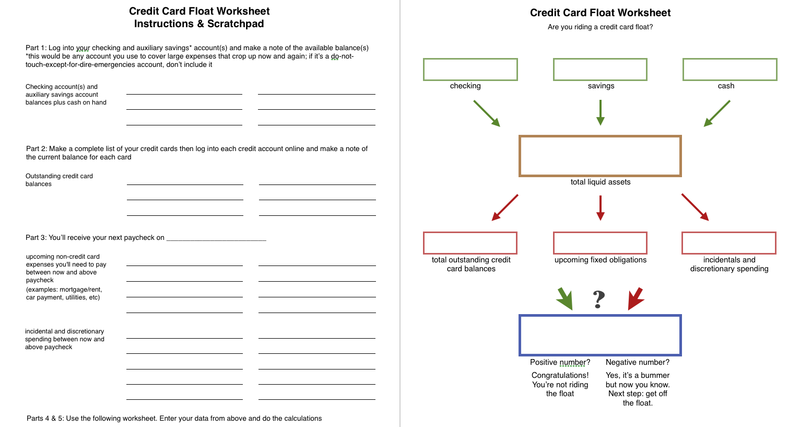 What is a Credit Card Float? Are you floating on your credit cards? First, the most widely used, generic definition of a credit card float refers to the cushion or “float” of time between when you make a charge to your credit card and when the money is actually due (when you have to pay the credit card bill). 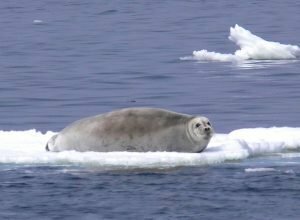 This float period can be anywhere from 21 to 52+ days. This variance in time has to do with where the purchase date falls in relation to your card’s billing cycle and statement due date. The second meaning of “float” refers to the use of a credit card to cover some portion of your everyday expenses today with the full intention and expectation of being able to pay the card’s statement balance in full by the due date — but doing so because although you will have the money when it is due, you do not have it right now. It is this second definition that I am referring to any time I write about or refer to credit card float or riding the float. In very simple terms, it matters if you are riding the float because you are very literally borrowing against your future income to pay for current expenses. Even if you are not paying any interest or monthly fees, if you are riding the float you are in debt. It bears repeating: If you are riding the float, you are in debt. I get clients all the time who know they’re in debt. They know because they have carried balances on their credit cards and they pay interest every month. It’s the clients who pay their credits cards in full every month, who haven’t paid interest in years or maybe even decades, who proudly announce they are most decidedly not in debt — delivering the bad news to them that they are in debt is the task I dread the most in my work. The revelation can be devastating to clients’ confidence and self-esteem. It completely contradicts their self-image and personal narrative. If the answer is a negative number (liabilities exceed assets), then you can skip Step 5. You’re riding a float. If Step 4 resulted in a positive balance, you have one final calculation left. Subtract your upcoming expenses (Step 3) from your remaining assets (Step 4). Note this final number. Is it a positive number or a negative number? If Step 5 results in a positive number, congratulations! You’re probably not riding the float. If Step 5 results in a negative number, however, you are riding the float. Don’t panic. And don’t beat yourself up. You’re most decidedly not alone. The good news is that now you know. You have a more accurate picture of your financial health than you did a few minutes ago. Believe it or not, this is a good thing. The even better news is that I’m putting together tutorials for how to systematically get off the float. I’ll be offering tutorials for both YNAB4 and the new online version of YNAB. If you’re not a YNAB user, I think you’ll still find some helpful tips for getting off the float. Update: The tutorial for users of the new web-based YNAB is now available. **This is where subtleties can come into the equation. Remember, this is not a test you’re desperate to pass at all costs so “cheating” is counterproductive. If your next paycheck comes in on the 1st and your rent/mortgage and several other significant bills are due the same day, awarding yourself a “not floating” determination on a technicality is silly. If it’s clear that your next paycheck won’t get you through to the following paycheck without using your credit card to pay for incidentals and discretionary expenses, swallow your pride and accept that you’re riding a float. Maybe it’s a very small float but it’s a float nonetheless. To summarize: first, riding a credit card float means you are having to borrow from the future in order to pay for current expenses, and second, it is possible to be in this form of debt for years, even decades, without being aware of the fact because you are not paying any interest or fees on your debt. Addressing, in advance, an argument some might make: yes, any time you have a balance on a credit card, you technically have debt. You owe someone money. The distinction is whether or not you could have paid cash for the purchase. In other words, there is a difference between having debt and being in debt. Choosing to charge a purchase even though the cash is available is a conscious choice; needing to charge purchases now and pay for them later because there is not enough cash available is a vulnerable (and financially unhealthy) situation.